You may have heard of Madam C.J. 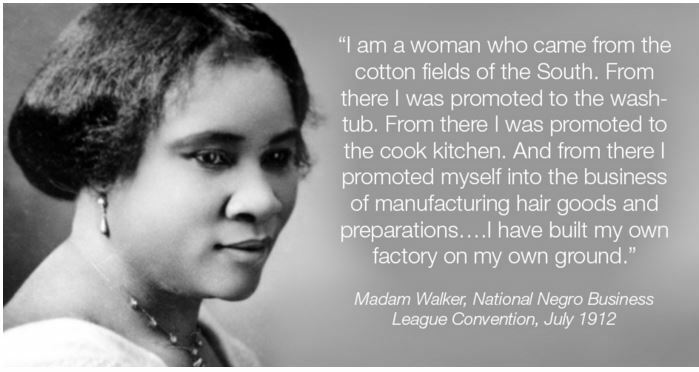 Walker, she is often quoted as the first self made female African American millionaire and the inventor of the hair relaxer. She didn’t actually invent the hair relaxer but this doesn’t make her story any less amazing. Born at the end of 1867 in the heavily divided South to former slaves she became an orphan at 7, returned to the cotton fields her parents had fled, married at 14 and eventually through hard work became an amazing entrepreneur. By 1916 she had move to Harlem and was one of the wealthiest African American women in the country. Walker (who was born Sarah Breedlove) had trouble with her hair falling out, as many other black women did, and eventually she became an agent for “The Great Wonderful Hair Grower”. She started selling this product to other women. Sarah’s second husband Charles Walker encouraged her change her name to Madam C.J. Walker, a distinguished name that also created an aire of respect, calling a black woman Madam was not common at all, a bold move. They also moved to Colorado. Around this time (early 1900s) she said a black man came to her in a dream leading her to create her own formula based on ingredients from Africa. This formula became known as “Madam Walker’s Wonderful Hair Grower.”. she sourced the ingredients and started selling her formula. Walker never shied away from fighting for African American rights. She organized her agents and pushed philanthropic and educational efforts among African-Americans. Harlem’s social and political culture. She founded philanthropies that included educational scholarships and donations to homes for the elderly, the National Association for the Advancement of Colored People, and the National Conference on Lynching, among other organizations focused on improving the lives of African-Americans. She also donated the largest amount of money by an African-American toward the construction of an Indianapolis YMCA in 1913. Walker left one-third of her estate to her daughter, A’Lelia Walker—who would also become well-known as an important part of the cultural Harlem Renaissance—and the remainder to various charities. Her life is absolutely fascinating and her hard work in such a tough time cannot be forgotten.